In June, after a thrilling seven-game NBA Finals victory over the San Antonio Spurs, the Miami Heat became the 2013 NBA champions. As a result of the Heat's star-stubbed roster and back- to-back title run, NBA fans of South Florida are once again enjoying a very enjoyable summer. 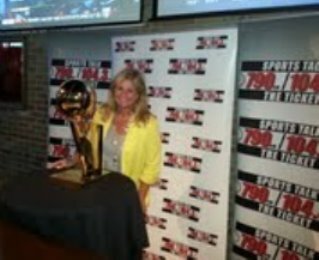 Last week, at an event sponsored by SPORTS TALK 790AM/104.3FM THE TICKET, the Whiskey Tango in Fort Lauderdale hosted a public viewing of Miami's 2013 Larry O'Brien NBA Championship Trophy. An iFolloSports.com tipster, who works for the Greater Fort Lauderdale Convention & Visitors Bureau, was at the event and submitted the above picture of her with the trophy. The legendary piece of hardware is an amazing 14.5-pound sterling silver and vermeil/24-carat gold overlay, created by Tiffany & Co. The piece is valued at $13,500.